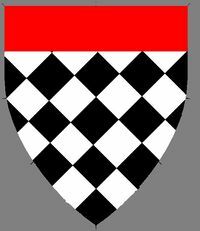 Fusilly argent and sable, a chief gules. I first heard about the SCA, or a group like the SCA, by reading "Folk of the Air" by Peter Beagle. The first event I went to was one of the Iron Bog Cooks Guild dinner and dance events in Sept 1996. Can't remember what it was called. The second event I went to was a couple weeks later in the Shire of Havre de Glaces in old city Quebec in a medieval tavern. I met the McGowans and (at the time not even Lord) Sir Mohammed there. That was *such* a cool event. I was made Deputy Exchequer in December 1996, three months after joining the Shire of Iron Bog. Since then I've been an officer all but 24 months (1 year off, then two 6-month stretches), although I was the co-head cook for a Royal Progress and stewarded an EKU during one 6-month stretch and the deputy royal court herald during the other. I've never been a local group herald. I'm toying with the idea of becoming my Canton's herald because it would be amusing. This was true when I wrote this; shortly after, I became the Baronial herald. The first household I was in was the Tribe Winged Wolf gypsy house. In time, that house fell apart. I still don't deny being Ragnesfolke, though I don't see them as much as I'd like. And I'm part of the House of the Stone Fountain, a service-based household of very good friends. 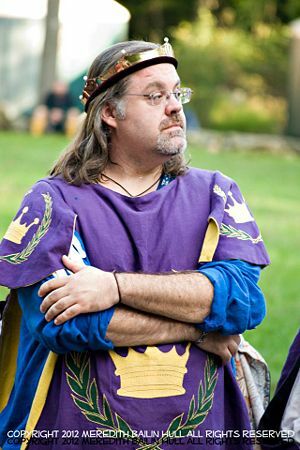 My first Pennsic was 26. I've made all but two since then. I don't love Pennsic and it's not like coming home for me like it is for some, but it's where a lot of my friends are every summer. I've camped in a lot of Pennsic camps. Winged Wolf Gypsy Camp, Ragnesfolke, Iron Bog as a part of the War Puppies, Iron Bog as its own camp, House Arindale, Ragnesfolke again, Strawberry Fields, and Bhakail. This page was last edited on 26 February 2019, at 00:10.